Math Alchemist is like math boot camp, it challenges your basic math skills intensively. Just because you got an A in calculus doesn’t mean you’ll master this game. This iPhone app requires fine-tuned arithmetic skills. There are different levels to play on, from beginner through master. The graphics are great, and it’s easy to maneuver to play different modes, go to the rankings, or find the instructions. The game has two modes: Original Mode and Time Attack Mode. Guess which one leaves you shouting at your friends, “Quick! What’s 6 x 8 – 4? !” Time attack mode gives you a choice of three different times to complete your equations in: 180 seconds, 360 seconds, or 720 seconds. After you’re finished, your high score will be posted on the Openfeint server. Your other option to play in is called Original Mode. 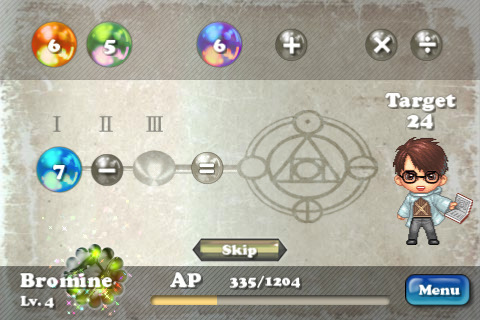 This mode is more RPG game like; it has stages for you to complete before you can move onto the next level, and you can earn and loose alchemy power. As with the Time Attack Mode, when you’ve earned bragging rights, you can post your scores on Facebook or Twitter. You get four numbers to choose from to make them equal 24. You can add, subtract, multiply or divide, but the kicker is you have to use all four numbers given. Any resulting number is placed in your queue to use as well. It resembles a puzzle game in the sense that it requires strategy, but above all, you need to know your math- especially if you’re playing the Time Attack Mode. Math Alchemist’s developers, Keo Brothers, work through a program called Openfeint to rank your and your friend’s progress, so that you can compete with one another. You can connect with friends using instant messaging, or invite them to play by joining the Openfeint fan club. If you decide to join the fan club, you’ll be able to see when your friends are playing the game. They even have a newsletter to subscribe to of upcoming game releases. Math Alchemist is a great way to start your day and get you going. This game in Time Attack Mode parallels a black eye coffee. AppSafari review of Math Alchemist was written by Amanda McFarland on March 31st, 2010 and categorized under App Store, Fun, Games, RPG. Page viewed 3820 times, 1 so far today. Need help on using these apps? Please read the Help Page.